Protecting and restoring the marine ecosystems of the Santa Barbara Channel is central to Channelkeeper’s mission. Aboard our boat, The Channelkeeper, we monitor critical marine habitats in the Santa Barbara Channel such as kelp forests, eelgrass beds and Marine Protected Areas (MPAs), educate the public about the importance of and threats to these habitats, and use the information we gather to support changes in public policy to better protect them. Channelkeeper played a lead role in California’s recent policy process to establish a network of marine protected areas (MPAs) along the Southern California coast. We are now working on several fronts to help ensure the effective implementation and long-term viability of these MPAs, by developing programs to monitor and enforce the MPAs in the Santa Barbara Channel and fostering widespread public awareness, responsible use and stewardship of these critical marine areas. Channelkeeper is also an active member of the Channel Islands National Marine Sanctuary Advisory Council’s Conservation Working Group, and recently produced a 230-page Water Quality Characterization Report for the Advisory Council to guide their current effort to develop a comprehensive Water Quality Protection Program for the Sanctuary. We’ve also partnered with the Sanctuary on numerous scientific monitoring projects, including a two-year project to monitor water quality at popular Channel Islands anchorages to help evaluate potential water quality impacts associated with recreational boating. Channelkeeper has successfully restored eelgrass beds at the Channel Islands and has spearheaded numerous subtidal monitoring projects to collect and disseminate important data useful for the protection of kelp and eelgrass habitats in the Channel. 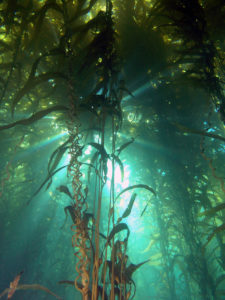 We also partnered with other southern California Waterkeepers on a Giant Kelp education, monitoring and restoration program from 2002-2008, monitoring and planting kelp and educating local youth on the importance of kelp forests and the marine environment. partnering with the Santa Barbara Waterfront Department to remove sunken debris from the bottom of the Santa Barbara Harbor.